If you’re an iPad, iPhone or iTouch user, I’d recommend you go download the new app called Showyou. The let’s you watch all the videos your friends are sharing in one place and it works with your TV if you have an Apple TV 2.0. 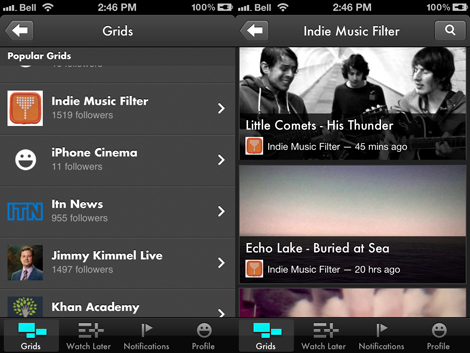 Plus, you can choose a video feed (or “grid”) from a number of sources, including videos that I’m collecting for Indie Music Filter (or more specifically, Indiemusicfilter.tv). Learn more from their video below, or just head to the store to get it. Let’s Showyou from Showyou on Vimeo.